It was April fools day today and the second month of Autumn. Well bugger me you would have mistaken it for a nice summers day not Autumn at all. You could not have asked for a better day. Pity there was a bit of a mix up with the starting time and daylight saving also thrown into the mix. There was the 3 of us on today's ride, perfect. Wayne had got his Ducati back from the shop after the 'incident' back in November. The bike was repaired and waiting to go for awhile, it was more his foot needed healing up and he was ready to get back into the swing of things. He wanted to go for a ride up the Putty Rd, as soon as I'd heard that I was in. Being one of my favourite rides and all. 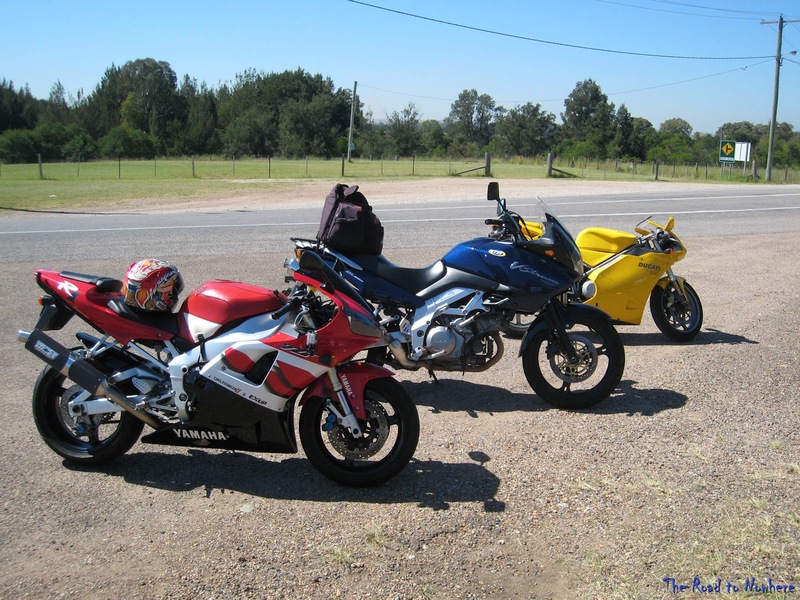 There must have been at least 30 bikes at the servo at Wilberforce this morning for our fuel up before heading off. And there was a lot more on the road ahead. Luckily most of them either we passed, or they passed us or they pulled into the Grey Gums Cafe. We continued on without stopping until we got to the 10 Mile section of twisties. When we stopped to set up the camera's I found my 32Gb memory stick on the ground where I had dropped it on the last ride! Still there in the same spot 2 months later. We stopped at the tav for an early lunch and cool drink, it was only 11:00am by the time we got here. I love sitting out the front of this place and just chillin out and watching all the bikes go by. And there were lots of bikes going by today. It was then back down the same way we had come, the run back down was not as good as the run up to lunch as on the way back we got stuck behind some cars for a little while. 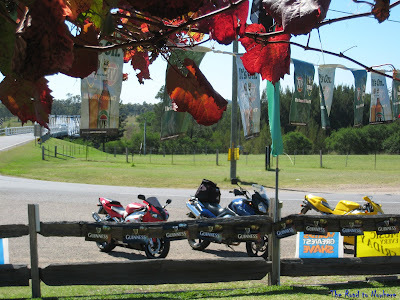 We then decided to pull into the Grey Gums cafe for a quick break. There were lots of bikes here when we went past about 2 hours before and there was still lots of bikes here. The Colo heights section of road is another good piece of tarmac on this road. This is filmed from the northern end coming down towards the river. That looks like a fun set of twisties. I found my eyes wandering between looking at the road ahead and watching your shadow dodge in front of your front wheel. I like the camera placement. Do you have a leg mount or a bracket on the bike for that angle? Glad you were able to get out and enjoy such beautiful sunny weather. I love it when Autumn is like a second summer. It gets a bit hipnotic doesn't it. I have the gopro mounted on one of those stick on mounts just near the indicator. We couldn't have asked for a better day. Weird weather all round I think mate. Looks like a blast of a day. I love the second pic by the way. Looks like our summer is now autumn. I really like there grape vine on the front verandah its really good with a breeze blowing in. Was that video sped up at the start? If not, slow down you lunatic! Nice roads and a great day for it. No the video was normal speed, changed the gopro setting to 960-48 for less shake picture quality is not as good though. That spot seems pretty good even on the 1080 setting. Have a look at the first video it should be up now.